The Roman Catholic Archdiocese for the Military Services, USA (formally the Military Ordinariate of Archdiocese for the Military Services of the United States), provides the Roman Catholic Church's pastoral and spiritual services to those serving in the armed forces of the United States and their dependents and to all military and naval bases, to the facilities of the Veterans Administration, and to other federal services overseas. It was originally established as a military vicariate, with the Archbishop of New York also serving as the military vicar. It was reorganized as an archdiocese, with its own archbishop and its see relocated to the District of Columbia by Pope John Paul II in 1986. The current diocesan bishop is Archbishop Timothy P. Broglio. He is assisted by several auxiliary bishops. Together, they oversee Catholic priests serving as chaplains throughout the world. Each chaplain remains incardinated into the diocese or religious institute for which he was ordained. The Archdiocese for the Military Services, USA is a personal jurisdiction, meaning that it has no defined territory and that its jurisdiction extends to those whom it serves throughout the world. It has jurisdiction wherever American men and women in uniform serve. The jurisdiction of the Archdiocese extends to all United States government property in the United States and abroad, including U.S. military installations, embassies, consulates and other diplomatic missions. Prior to the creation of the Military Ordinariate and then the Archdiocese for the Military Services, the armed forces of the United States was served by an informal corps of volunteer priests. Beginning in 1917, the spiritual care of those in military service fell to the Military Vicariate, the equivalent of a personal vicariate apostolic, that is, a particular church the membership of which is defined by some personal quality (as in this case being a member or a dependent of a member of the armed services) that is headed by a legate of the pope. Originally, the ordinariate was headed by then-Bishop Patrick J. Hayes, an auxiliary bishop of the Archdiocese of New York who served double duty as papal military vicar for the United States beginning on November 24, 1917. 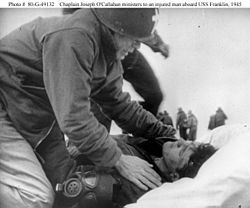 Chaplain Joseph T. O'Callahan ministers to an injured man aboard USS Franklin (CV-13), 1945. Hayes was chosen because New York was the primary port of embarkation for U.S. troops leaving for Europe and therefore a convenient contact point for Catholic chaplains serving with them. When Cardinal John Farley, Archbishop of New York, died, Hayes was appointed as his successor and kept the additional title and duty of military vicar. In November 1939, the Holy See established the Military Vicariate of the United States of America. The post remained an additional duty of the archbishop of New York from Hayes' time until Cardinal Terence Cooke began plans to separate it as its own jurisdiction in the early 1980s, plans he was unable to carry out before his death in 1983. Cardinal John Joseph O'Connor—a retired Navy chaplain with the rank of Rear Admiral, having served as chief of Navy chaplains (the military's title for its own senior chaplain officer) who subsequently served as an auxiliary bishop for the Military Vicariate—succeeded Cardinal Cooke as Archbishop of New York and Apostolic Administrator of the Military Vicariate. He oversaw the completion of the transition. On July 21, 1986, Pope John Paul II reconstituted the military vicariate as the present Archdiocese for the Military Services, USA, naming Archbishop Joseph T. Ryan its first archbishop. As of April 2013, about 25% of the U.S. armed forces are Catholic. Chancery of the Archdiocese for the Military Services, USA, in Washington, D.C. The diocesan chancery is located in Washington, D.C. The Geneva Conventions state (Protocol I, June 8, 1977, Art 43.2) that chaplains are noncombatants: they do not have the right to participate directly in hostilities. Captured chaplains are not considered Prisoners of War (Third Convention, August 12, 1949, Chapter IV Art 33) and must be returned to their home nation unless retained to minister to prisoners of war. For historic photographs of Army chaplains in World War I, World War II, Korean War, and Vietnam War, see Army Chaplain Corps Museum. John McElroy, S.J. – One of two of the Army's first Catholic chaplains. Founder of Boston College. Anthony Rey, S.J. – One of two of the Army's first Catholic chaplains. Vice president of Georgetown College (1845). First Catholic chaplain killed during service with the U.S. military. For Civil War chaplains, see footnote. Emmeran M. Bliemel, OSB – He was the first Catholic chaplain killed in action during the Civil War. William Corby – He is famous for giving a general absolution to the Irish Brigade at the Battle of Gettysburg. John Ireland – He served as a chaplain of the 5th Minnesota Volunteer Infantry Regiment. Bernard John McQuaid – He volunteered as a chaplain and accompanied the New Jersey Brigade to the seat of war, during which service he was captured by the Confederates. Francis P. Duffy – Chaplain for the 69th Infantry Regiment (a military unit from New York City and part of the New York Army National Guard) – known as "The Fighting 69th" – which had been federalized and redesignated the 165th U.S. Infantry Regiment. John Joseph Mitty – In 1919, he was assigned as Catholic chaplain at the U.S. Military Academy; during his tenure at West Point, General Douglas MacArthur served as superintendent. Colman O'Flaherty – Chaplain with the 1st Infantry Division; was killed in action, in France; posthumously awarded the Distinguished Service Cross. 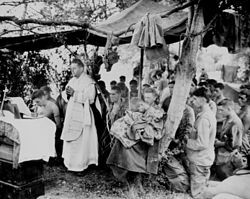 A US Navy chaplain celebrates Catholic Mass for Marines at Saipan, June 1944, commemorating comrades fallen in initial amphibious landings. 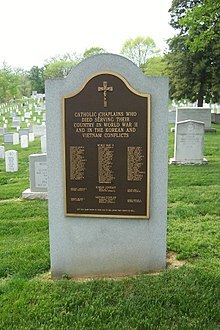 The Catholic chaplains' monument on Chaplains Hill in Arlington National Cemetery. John F. Laboon, Jr., S.J. A Roman Catholic army chaplain celebrating a Mass for Union soldiers and officers during the American Civil War (1861–1865). ^ Bunson, Matthew (July 4, 2017). "Shepherding God's Military Flock". National Catholic Register. EWTN News, Inc. Retrieved July 4, 2017. ^ Karen Jowers (April 5, 2013). "Training material listing Catholics as 'extremists' angers archdiocese". Army Times. Retrieved April 7, 2013. ^ Archdiocese for the Military Services, USA, official website. Retrieved August 20, 2010. ^ Military Heroes. Mission Capodanno website. Catholics in the Military. Retrieved August 11, 2011. ^ a b O’Conner, Thomas H. "Breaking the religious barrier", The Boston Globe, Boston, May 10, 2004. ^ On the following page, go to the link for "Chaplains" and then click on the "USA Chaplains" link or the "CSA Chaplains" link. "Home page". The National Civil War Chaplains Museum. Archived from the original on November 15, 2011. Retrieved October 20, 2011. ^ "Rev. Emmeran M. Bliemel – Hero of Battle of Jonesboro: 10th Tennessee Regiment: The first American Catholic Chaplain to die on the battlefield". The National Civil War Chaplains Museum. 2008. Archived from the original on April 25, 2012. Retrieved October 19, 2011. Chaplain of the 10th Tennessee Regiment, he courageously and unselfishly ministered to the spiritual needs of all the wounded, both under fire and behind the lines. He died while giving the last rites to his Commanding Officer, Colonel William Grace. Rev. Bliemel also ministered to the men of the 4th Kentucky Regiment (the Orphan Brigade). ^ McClarey, Donald R. (October 3, 2016). "Hero of the Maine: Father John Chidwick". CatholicStand. Retrieved December 2, 2016. ^ a b c d e f g h i j k l m n o On Chaplains Hill in Arlington National Cemetery is a monument for 83 Catholic chaplains who died in World War II, the Korean War, and the Vietnam War. ^ Ryan was a Navy chaplain from 1943 to 1946 and took part in the Marine landing at Okinawa. He served as chancellor of the U.S. Military Vicariate from 1957 to 1958. On February 7, 1966, he was appointed the first archbishop of Anchorage, Alaska, by Pope Paul VI. He was consecrated a bishop on March 25 by Cardinal Spellman. On November 4, 1975, Ryan was named coadjutor archbishop for the Military Vicariate and Titular Archbishop of Gabii. After the death of Cardinal Cooke, Pope John Paul II elevated the Military Vicariate (which had been run by the Archdiocese of New York) to the rank of an archdiocese and named Ryan the first archbishop of the Archdiocese for the Military Services, USA, on March 16, 1985. ^ A Servant of God, Father Kapaun died in a POW camp and was posthumously awarded the Medal of Honor on April 11, 2013 by President Barack Obama. Milburn, John, "Army says Kansas Army chaplain Rev. Kapaun worthy of Medal of Honor for service in Korean War"[permanent dead link], Associated Press, October 13, 2009. Baltimore Sun website. Retrieved October 15, 2009. The article includes an undated photo (released by the Catholic Diocese of Wichita), showing Fr. Kapaun saying Mass in the field. ^ Chaplain Dennis Murphy celebrates mass for the men of 65th AAA Bn., at Bolo Point, Okinawa. July 19, 1951. http://www.reporternews.com/photos/galleries/2010/jun/24/look-back-korean-war/18954 Retrieved September 6, 2013. ^ For information about Father Brett, go to "United States Navy Chaplain Corps § Notable chaplains" and click on the three footnotes next to his name. 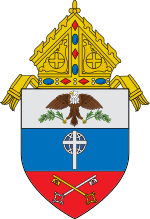 ^ Scroll down – through the 32 ecclesiastical provinces (in alphabetical order) – to the Washington archdiocese, below which is the Military Services archdiocese and its archbishop and auxiliary bishops. O'Malley, Mark Francis. An History of the Development of Catholic Military Chaplaincy in the United States. Gregorian University, 2009 (dissertation). Boyle, Maureen (October 28, 2011). "Priests in Uniform: Twice Called to Serve: A growing number of men bravely fill a crucial need as Catholic military chaplains". Columbia. Knights of Columbus. Retrieved November 5, 2011. O'Neill, Eddie (November 7, 2010). "Keeping faith alive on the front line: Ministry hopes MP3 players with spiritual content strike chord with troops". Our Sunday Visitor newsweekly. Retrieved November 3, 2010. Weatherbe, Steve (September 20, 2010). "Spiritual Sustenance: New Organization Feeds Sacramentally Starved Troops". National Catholic Register (print edition). Retrieved September 25, 2010. O'Neill, Eddie (February 7, 2010). "In the face of weakness, strength in the Spirit: Diagnosed with the terminal illness commonly known as Lou Gehrig's disease, one priest shares his experience and understanding of suffering". Our Sunday Visitor. Retrieved November 3, 2010. . Fr. Dan Farley is a fifteen-year veteran of the U.S. Army chaplain corps. He retired as a chaplain and returned to St. Maximilian Kolbe Parish in Portage County, Wisconsin, in the Diocese of La Crosse, in June 2009. Daigle, Fr. David, "Snapshot of a shipmate: LTJG Philip Johnson", Catholic News Agency, Washington D.C., June 21, 2008. Retrieved 2009-09-13. "Vicar General for the Diocese of Fargo to return to active duty", Catholic News Agency, Fargo, N.D., February 11, 2008. Retrieved 2009-09-13. "Chaplains are entrusted with spreading Gospel of peace in military, Pope says", Catholic News Agency, Vancouver, Canada, October 26, 2006. Retrieved 2009-09-13. 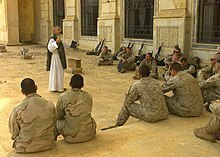 "Colombian priest to provide chaplain services to Hispanic US troops in Iraq", Catholic News Agency, Orlando, Fla., June 8, 2006. Retrieved 2009-09-13.